Beautiful beans! These little legumes really don’t get the credit they deserve. They’re affordable, packed with cruelty-free protein, rich in fiber, easy to prepare, versatile and delicious! Need I say more? See, I’ve been hearing some nasty rumors about beans lately. Some people say they’re making us gain weight. Others claim that they’re interfering with our blood sugar. Some even say we should avoid legumes because they contain “anti-nutrients.” What?! I know there’s a lot of information out there when it comes to what to eat for optimal health, which can be confusing. We’re constantly bombarded with messages about which foods cause disease and which prevent it, what we can (and can’t) eat if we want to lose weight and what’s safe to feed our families. Don’t get me wrong, many of these messages about food are not only valid, but also incredibly important. But when the facts are cherry-picked, how can we possibly decide what to listen to? The truth is out there! And when it comes to the bean debate, I’m gonna help you find it. That’s why I asked our super-knowledgeable Nutrition Director, Jen Reilly, to weigh in. Wait ‘til you hear what she has to say—it’s gonna restore your love for beans! Beans are among the cheapest sources of protein on the planet and produce the lowest level of greenhouse gases per gram of protein (World Resources Institute report on Sustainable Diets). They may be responsible for keeping your heart healthy by preventing coronary heart disease—meaning they lower or prevent high blood pressure and help ward off strokes (study). They’re chock full of antioxidants, which prevent inflammation, aging and may reduce the risk of cancer. 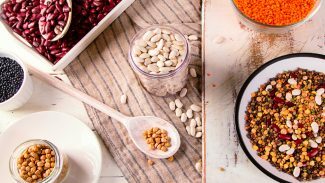 Because of their hard-to-find soluble fiber, eating 3-½ or more servings a week (about 1-¾ cups cooked beans or lentils total over the course of a week) will lower your type 2 diabetes risk by 35% (study). However, despite all of the support from the medical community, beans have started getting a bad rap. The criticism mostly stems from the latest pseudoscience-based diet fad that tells us we should avoid foods that contain lectins. Plus, we’re hearing buzzwords like “phytates” and “anti-nutrients” used in misleading ways to criticize beans. This negativity is also riding on the coattails of the anti-carb craze. Because yes, some people are still trying to convince us to be afraid of carbs, even the healthy, complex ones from the plant kingdom. Myth #1: The lectins in beans are “anti-nutrients” that cause IBS, inflammation, obesity and some autoimmune diseases. Lectins are a protein found in a third of the foods we eat, and they are especially high in beans, grains and seeds. These guys are the latest in a string of enemies named by fad diets. Some lectins may be harmful and may be responsible for damaging the intestinal wall leading to nausea, diarrhea and vomiting. It’s also possible that people with digestive issues such as Crohn’s disease and irritable bowel syndrome are more sensitive to the damaging potential of lectins. But, proper cooking eliminates the harmful ones almost completely (more on how to make sure you’re properly cooking your beans below). Back in 1988, lectins started giving beans a bad name when a number of hospital workers got sick from eating a kidney bean dish that wasn’t properly cooked (study). Unfortunately, beans’ image took another hit in 2006 when a Japanese TV broadcast introduced a new weight loss strategy that called for sprinkling powdered, toasted white kidney beans onto staple foods. Those beans weren’t cooked properly, either (kidney beans should be boiled for at least 60 minutes after soaking and these were toasted for just 3!). As a result, over a thousand viewers suffered from intestinal problems and 100 people were hospitalized (aka “the white kidney bean incident in Japan”). No conclusive research has been done in humans to support claims that properly cooked beans are responsible for causing IBS, inflammation, obesity, etc. In fact, there’s a large body of research on the health benefits of lectins! Studies indicate that they may improve gut health, prevent tumor growth, slow down cancer cell growth (study) and prevent obesity. Here’s another thing to keep in mind: Most healthy plant foods contain lectins. Ya know what else they contain? Fiber! Fiber is essential for a healthy metabolism and digestion, as well as a strong immune system. It also helps prevent cardiovascular disease and diabetes. Avoiding lectins means avoiding plant foods, and avoiding plant foods means avoiding fiber. You catch my drift? Myth #2: Beans contain phytates, which bind to minerals and slow their absorption. It’s true that the phytates in beans may slow or reduce the absorption of certain minerals. But, beans also happen to be quite rich in those very minerals! 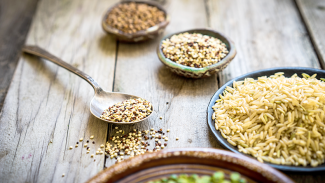 The confusion may come from the fact that some foods (such as whole grains) are rich in phytates but not as high in minerals as legumes, meaning that it may be harder to absorb enough minerals from those foods alone. But unless your diet is very high in high-phytate grains with very little legume variety, this shouldn’t be an issue. And if you want to play it extra safe, load up on garlic and onions in your bean dishes—they’re pros at increasing mineral absorption. Score! Here’s something else that the critics often don’t take into account: Phytates actually have a handful of positive traits. They may stop the growth of cancer cells (research article) and prevent osteoporosis (study). So, as long as you’re getting plenty of mineral-rich foods (which is exactly what you’ll get if you eat a variety of plant foods) in your daily routine, you may actually benefit from the phytates in beans. Go figure! Myth #3: Beans are “high carb,” so they cause blood sugar spikes. This criticism is misleading and simply not true. And it really makes my beans boil because I have two kids with type 1 (insulin dependent) diabetes. They eat beans nearly every day and I’m able to watch their blood sugars on continuous glucose monitors every 5 minutes. The digestion of carbs in beans is so slow that we often see a welcome, slow and subtle rise in their blood sugar levels several hours after eating beans. Nothing even close to a “spike” occurs. In fact, I attribute their steady blood sugars (few spikes and few crashes) to their bean-heavy diets. And the research backs up my at-home experience. Studies suggest that because of their low glycemic index (due to high fiber content), the digestion of carbohydrates in beans is slower, doesn’t cause blood sugar spikes and results in better long-term blood sugar control as indicated by lower hemoglobin A1C (HgbA1C) blood test results. Some argue that the fiber in beans is the real reason that people who eat a lot of them have better blood sugar control. But one study dispelled this myth by comparing two different diets for type 2 diabetics. One diet contained 1 cup of legumes per day and the other contained no legumes, but included an increased amount of insoluble fiber. The group consuming the legumes had better long-term blood sugar control than those consuming a diet high in fiber but devoid of legumes (study). Myth #4: Animal protein is more high-quality than the protein in beans—and the protein in beans isn’t sufficient for building and maintaining muscle mass, especially as we age. Animal protein is “complete,” meaning that it contains all nine essential amino acids, which are building blocks for our bodies. Animal protein also has more protein per ounce than legumes. Some folks suggest that these tidbits mean that animal protein is better quality than plant protein. This argument would only hold up if it were difficult to meet our basic protein needs with plants—and that’s simply not the case. Legumes contain eight of the nine essential amino acids needed to build protein (and soybeans actually contain all nine!). But, the ninth amino acid (methionine) is easily found in whole grains. Most adults can meet their methionine needs by eating four servings a day of whole grains (for example: one bowl of oatmeal, two pieces of whole grain bread and a serving of quinoa). Now, as for building and maintaining muscle, getting enough high-quality protein (which can come from beans and a variety of other plant sources) is just one piece of the puzzle. In fact, there is such a thing as too much! Research shows that eating more protein than your body really needs in a day (multiply your weight in pounds by 0.36 or your weight in kilograms by 0.8 to get your daily requirement in grams) has no benefit and can actually be harmful to kidney function and bone health. You can build and maintain muscle mass by getting the right amount of protein, practicing regular strength and resistance training and eating plenty of complex carbohydrates. This does take more maintenance and dedication as we age (because estrogen and testosterone levels decline) but it’s far from impossible. Moreover, no validated research indicates that animal protein is an essential piece of the puzzle. Beans are a staple in many of our diets… but are they really all that good for us? Here’s what you need to know about beans! Soak your beans overnight before you cook them. This makes them easier to digest and starts the process of eliminating the harmful lectins we talked about. Learn how long to cook your favorite beans. Kidney beans require the longest cooking time, so boil them for a full hour. Other beans only need to be boiled for 20-30 minutes (actual time depends on size—smaller beans need less time) as long as they’ve been soaked. Using a pressure cooker is also a great way to ensure beans are fully cooked in less time. Ease legumes into your diet if you’re not already regularly eating them. Start with smaller varieties like lentils and black-eyed peas. Consider cooking them with kombu seaweed, which contains enzymes that break down gas-causing compounds. This should make them easier to digest. Consider adding probiotics and digestive enzymes to your routine (read more about those here) to ease digestion. Look for BPA-free cans or BPA-free tetra paks when you’re buying prepared beans. Also be sure to rinse them well to remove excess sodium. Here’s the bottom line: Beans are not the enemy. They’re an important part of a healthy plant-based diet. You shouldn’t need to avoid them unless you have an allergy or particular digestive challenge like Crohn’s or irritable bowel syndrome. If you do have Crohn’s or irritable bowel, some of the tips above may help if you want to eat beans—consult with your doctor when in doubt. I hope this information eases any concerns you might have about beans. If you have any remaining questions, ask them in the comments below. I’ll be answering as many as possible! Thank you, Jen! That was fascinating and so helpful. And beans—thank you, too! Here’s something I want you to remember: When it comes to food, many people and organizations have a lot on the line. They may have your best interest in mind, or they may have other motivations clouding their vision. You are wise and intuitive, and you know better than anyone else what’s good for you. Let your voice be the loudest. Your turn: What are your burning bean questions? I’d love to hear what’s on your mind in the comments below! Let my new album, Extraordinary: Meditations for Miraculous Living be your guide. Each track will help you get into the mindset of greatness so you can feel and be your very best! Check it out here! As usual another very actionable post from Kris!! I totally agree. This is such an mis-understood & under utilized food group. I was just wondering exactly which “fad diets” are giving beans a bad wrap, so that I may keep an eye out for them and not be swayed? Secondly, where are you getting your daily protein requirements figure? In my studies, it’s always been 0.7 per kilo of body weight. 0.36 seems very low to me. KRIS YOUR ARTICLES ARE EXCELLENT. I WILL BEGIN TO EAT THOSE LITTLE STAPLES MORE OFTEN. THANK YOU. I was looking at the keto diet and found out no beans! i dont think I could do that part of it. I love beans in homemade black bean salsa and more. this article helped put my mind at east for sure. thank you as along term bean eater i have also been baffled by all the reading saying they shouldn’t be part of a healthy diet and since i am vegetarian and try to keep it vegan a lot of the time the pulses are really necessary. what works and what doesn’t, so thanks for shedding a light on them beans! I love soaking brown chick peas overnight with the innards of a lemon and boiling them up in the morning. I must say I was doing this long before developing autoimmune diabetes; so cannot comment on cause and effect (though I have my own theory that in my case, far from being hereditary the autoimmunity was iatrogenic). One thing I would emphasise is that HbA1c tests are a very crude ‘test’ for blood sugar levels. They only give you one reading for the last ten weeks (roughly the lifespan of a red blood cell) so include extremes of hypo and hyper glycaemic incidents. I keep telling them I need Continuous Glucose Monitoring but they tell me it would be dangerous to put me on a pump. I find it impossible to remember whether I have injected insulin or not; so am likely to double dose. As far as I am concerned exogenous insulin is always dangerous. I am just looking forward to pens attached to electronics to pass the Food and Drugs Administration so that I do not have to rely on records of what I cannot remember (needles put my head into a numb state – and usually they can’t even take enough blood to check for ketoacidosis because my whole circulation system has frozen at the sight of healthcare practitioners who don’t know what they’re doing). Since I can score whatever number they want they don’t care how many hypos I have and I once feinted for three days without anybody noticing. This was complicated because they misdiagnosed me as having type 2 on account of my age. Age is known to be irrelevant; but professionals rely on probabilities generated by empirical evidence. Frankly to be told (four years later! – by which time my life was in ruins) ‘don’t worry; we often get it wrong’ is not likely to increase my faith in their treatment. It would be so easy to take a waist/height measurement to decide whether it is worth sending a blood sample to test for antibodies. It should be obligatory before an arbitrary decision on ‘type’. Diabetics are not necessarily typical; my lifestyle was never a problem. Ideally I feel the umbrella term ‘diabetes’ should be renamed to reduce such frequent misconceptions amongst the public and healthcare practitioners, who should base any labels on accurate information. More often it is me telling them what is going to be available. They think if they have got away with getting it wrong for 30 years, their expertise is unquestionable. I am learning to growl. Makes perfect sense, since every body is different. 😊 Thanks for the reply! Great article, thank you! I sometimes cook black kidney beans in the slow cooker (on low for 6 hours) when I’ve forgotten to soak overnight, but I resently read that the temperature in the slow cooker isn’t high enough to remove the lectins, is this true? It refers to Methionine – the daily amount of cup of oatmeal, 2 pieces of whole grain brain and a serving of quinoa per day will keep my weight on and I won’t be able to lose my last 15 pounds. I am 54 and that is too much carbs/sugar. Is there a powder of methionine that can be taken per day or does the body do fine with less of this per day ? I am not a runner and running or an hour on elliptical may burn the 2 slices of. Bread. But that’s too much for my joints. And I love all the choices. I love Brazil nuts for the selenium also ! And making but mills. Jen and Kris, you have no idea how you have eased my mind. My spiritual path is soon asking me to be vegetarian and I have been letting go but stressing about weight loss weight gain beans. It was very upsetting also the the Whole 30 eliminates. beans and lentils and grains. Too tough. Sending love to you both. There is something about Kris – it must your big heart and laugh – that when you write the info needed and on point, I completely trust. What about adzuki beans? Easier to digest? I have IBS, split pea soup and adzuki beans work well. I once tested allergic to legumes. And, are you saying no animal protein ever? It seems to settle my stomach (only eat organic grass fed beef, organic chicken, turkey and, well, fish, hard to find organically raised fish). You left out source of B-12 and that most soy is gmo. In fact, soy products cause me severe gastrointestinal distress. I question your promotion of soy for many reasons. Thank you for the article- i’ll try your suggestions. What about adzuki beans? Easier to digest? I have IBS, split pea soup and adzuki beans work well. I once tested allergic to legumes. Thank you very much, Jen. Wondering if organic, non-gmo soy wouldn’t cause the severe stomach distress and major diarrhea-do you know? I like tofu. Watching how tofu is made, could it be made using a different bean? Thanks for info that smaller beans easier to digest. Is it ok to include a bit of organic animal protein? I wonder because I’m O blood type and it does seem to make my stomach feel better. Raw greens, very difficult to digest. Hello, I eat beans/lentils everyday. They are my main source protein. I read that pyates in beans can interfere with calcium absorbtion. I have Osteoporosis. I rinse canned beans and soak dry beans overnight. I’m not sure if this helps enough. It’s also important to make sure you are getting enough vitamin k2 when you are taking vitamin D or calcium otherwise you get calcium buildup in the arteries. Vitamin k2 can interfere with anticoagulants. Thanks, Kris. Excellent info. Thanks, Jen. Appreciate everything you guys do to help us glean the truth out of all the noise out there. Thank you for this article! I love beans but beans do not love me. I love how beans taste and I want to eat them, but I produce the most toxic gas when I do. It’s so bad, and just plain annoying, so I almost completely avoid beans. I’ve found that following the advice in the book Eating Right for Your Blood Type is the closest group of dietary guidelines that work best for my body (I’m type O+). But even that says that I should be able to eat certain kinds of beans and yet, I still just do not digest them well. All my siblings eat beans w no problems at all. As long as I can recall eating beans has caused me to become bloated and gassy I just avoid them entirely now—even when using enzymes. Any suggestions you think may help? Great and timely article, Kriss. I am also fed up of the recent anti-carb nonsense. Can’t help suspecting that the meat and dairy industries are pushing this trend. Fantastic post!!! I’ve eliminated a bunch of foods recently because I found they were exacerbating my eczema. Beans are a food that DOES work for me, and I’ve been incorporating them in lots of meals. But I’ve also read those diet books that caution against beans, and I wasn’t sure what to think. Thanks for easing my mind! My husband and I love beans and eat them often. I have no problems after eating them but my husband, let’s just say we both suffer after he eats them. He’s tried taking enzymes before eating them but I think that makes things worse. Any suggestions? I love this Kris! Thank you both for this helpful information. This says a lot about how prepare beans but I was wondering about canned refried beans. I have them often, sometimes with garlic powder, onion powder and red pepper flakes. Is there a proper way to prepare them too? I usually just move them from can to pot and warm them for 5mins. Should I be preparing differently? I was told that they are already cooked enough and just need heating. Is that a myth too? Thank you Kris and Jen! I eat beans a lot, so this is very helpful to me. I was happy to see this because the beans and rice hesitation has occupied my mind many times throughout the last hand full of years… I enjoy that combo and have eaten them for years prior… I’ve still eaten them here and there as the walls of fear tumble down more and more from not seeing any change in my challenge through “limitation oriented” eating shifts… I soak ’em overnight, have a few favorite restaurants that may or may not soak ’em… Delicious… I will always eat healthy and am now thinking the key is to just do that while having fun in your world without always thinking in a “contracted” way… This just feels right… Is it a “feeling of contraction”(Mingtong Gu) that is really what is hurting someone and causing their pain? I soaked my lentils for 12 hours and cooked them for 30 minutes, but I forgot to rinse them before I cooked them. Talk about timely. I just went to my doctor, and my fasting blood sugar was 100. That is too high, but she said I need more protein, and beans don’t count. Because beans are a carbohydrate. I have been a dietitian since 1992, and everything I ever read about beans was good. I do not eat very much meat, so my protein has to come from other sources. She suggested pea protein. That is processed and a starch. It was nice to read something that goes along with what I have learned my whole life. Thank you. Thank you Kris! We are feeding our one year old beans already so for us this important post was very clarifying. It can be very challenging to sort out complex information when, in general, we tend to be offered sound bites. With a little one it feels like even more is at stake, and so we really appreciate your work. Do canned beans meet the recommended cooking requirements? If they are in BPA free cans, are they a good quality source to consume? Many thanks. Thank you for this common sense-filled article. You provide a voice of calm and rationality in today’s confusing world of nutrition advice! This is interesting! I haven’t eaten beans in such a long time because they give me such horrible gas. I am making an appointment to go see a Gastroenterologists doc to see what is going on with this and other issues. I miss humus and other bean dishes. If I have any issues it’s nice to know I might eat them again one day. Thanks for the response Jen! I am a year out of chemo for ovarian cancer, so I am trying to eat vegan. I do not feel that animal protein is good for my past diagnosis. Do you have any other tips for protein sources? I use beans, nutritional yeast and nuts. I will add some meats if I have to in order to improve my glucose which has started being elevated. Hi Kris! I would love to know how best to prepare dried black beans (they stink up the apartment when I soak them and sometimes taste rancid after cooking) and dried chick pea (they are always crunchy despite hours in crockpot and soaking for 1-2 days). Love them but I don’t love the prep work and the stink! Thanks! Thanks, Kris for all of your important info! The phytate debate is always an interesting topic! Fantastic tips at the end there being plant-based I eat a lot of beans so I will be sure to take those into consideration. cook a little longer than a waffle–come out crispy! some other beans can be used but not kidney beans! good info in your article. also–false info on beans to sell their products. I eat beans 1 or 2 times/week–& never pass any ‘air’ or gas. Thanks for this Jen.I highly recommend you read Dr Bernstein’s Diabetes Solution. I have type 1 Diabetic child and it has been a remarkable breakthrough.There was also this article published in the New York Times. https://www.nytimes.com/2018/05/07/well/live/low-carb-diet-type-1-diabetes.html Low Carb high Protein is not a fad diet for diabetics and should become main stream. There are vegetarians in this group. In my opinion a diabetics pancreas is not able and should not be required to process a carb like beans. Excellent information! Thank you ladies! Question….I use an instant pot to cook my beans and legumes because you don’t need to soak them first. Do you have any information if this is adequate for breaking down the lectins the same way soaking does? It is just so much easier and faster! I don’t have any digestive issues using them this way so hopefully that means the nutrition is the same. Thanks so much! Aww, thanks 🙂 Adore and enjoy both of you! I eat my legumes sprouted and raw… Mung,chick peas,lentils,alfalfa,fenugreek…etc. .
All delicious in any dish,or for thickening vegan mayonnaise!!! Hi, thanks so much for the lowdown on beans. I love beans! I’ve just tried making homemade (organic) soy-milk for the first time recently which of course contained much more soybeans per water ratio than the store-bought ones. I had terrible stomach pains from gas for hours after drinking a whole cup full. Do you think doing this Kombu trick might help with this? or was it just too much that I consumed at once? Enjoyed the article – beans are one of my favorite protein sources! I do have to comment on the protein requirement though. I was tested (by a Functional Medicine) doctor and actually found to be deficient in protein (need over 100g and I am 175 lb). I have two vegan protein powders and even had to do an animal source (marine collagen) to get enough. I’m on a plant based diet with home meal delivery. Beans are a big part of the program but rarely do the reciepes call for more then warming up the beans via pan cooking. I have read some about leaky gut and lectins. In essence, is my home delivery plant based diet coming up short? To help make beans even more digestible – and to make nutrients more available – you can sprout them and then eat raw ( in moderation) or then cook them. Sprouting reduces or eliminates phytstes and predigesting starches, proteins and fats. PS. There has also been talk of beans being too high in glutamine for a cancer fighter. Apparently cancer feeds on glutamine. Any comments? Thanks for your blog post. It was packed with some new information for me. Very helpful. However, today at work place somebody was rejecting my dietary intake of sprouted mung beans and pomegranate seeds (together). The concern they voiced was of lectins and mentioned that mung beans need to be cooked and not to be eaten as sprouts. I am puzzled! I do eat kidney beans pressure cooked in Indian curry form which is my favorite. But what’s wrong with sprouts? I have a question about canned beans. I have heard that cooking beans in a pressure cooker gets rid of harmful lectins. Have canned beans been cooked properly? Question: If legumes are so good for me, why do I have to “ease them” into my diet? They caused me so much grief for years. I tried to be vegetarian, ate numerous servings of black beans and rice, and had horrible, horrible digestive issues. Now I avoid them like the plague, eat organic/hormone free meat, fresh veggies and fruit, and have no digestive issues. Over twenty years of gut issues solved by removing legumes, grains, and lectins from my diet. Life got much simpler. I loved the taste of black beans, but they were a nightmare for me for so many years, same with corn/grains. No food should have to be “eased into eating”. No “body” has to adjust to eating meat/fish, veggies and fruit. It just works, because it is how we are made to eat and thrive. Beans (legumes) contain a particular carbohydrate called oligosaccharides which some people have difficulty digesting. The article pertains to lectins. For me, it depends upon the type legume and how it is prepared. I am able to eat red lentils easily. A typical multi-bean salad on the other hand makes me particularly gassy. However, mashed refried kindey or black beans are not a problem. But, animal products are not immune to digestive issues. Some people also have difficulty digesting lactose in milk. Also, regular consumption of red meat has other potential health problems, including increased cardiometbolic disease and cancer risk. (I feel ill if I eat red meat.) No food is perfect, so we each experiment and find the right combo that works. Regardless, the best approach is to keep our diets plant-centered, supplemented with agreeable protein-rich foods, vegan or carnivore. If I regularly ate animal protein, I would prefer seafood and poultry. Unfortunately, since we have contaminated our oceans, we have to be careful with how much seafood we eat because of heavy metals. Hi. 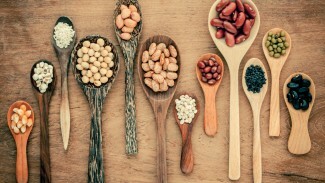 Loved the article on beans and legumes. What about gluten in whole grains. Gluten is inflammatory even if you are not celiac…..
Bean bashing has to stop. Thanks for the myth debunking. It’s tiring when people present their hypothesis as fact when there is no substantial evidence to back it up. I have yet to come across any dietary research linking lectins in whole foods, when properly prepared, to the various health conditions that anti-lectin proponents claim. How does fermenting cooked beans (tempeh) affect the lectins in beans? Any tomato myths to conquer?